At the First Presbyterian Church of Meadville, worship is central to our life and mission. The primary purpose of worship is not to entertain, inspire, motivate, or instruct. It is to render to God the praise, adoration, and sacrifice which is God’s due. In the process of worship in spirit and in truth, all of those other things may or may not occur. The point is not what we get, but rather what we offer — ourselves, our souls and bodies, as a holy and living sacrifice to God, together with our praise and adoration. In so doing, we are transformed bit by bit into the person we were created to be: a holy witness to the transforming power of the Spirit of God in Christ. We therefore choose to enrich our worship by drawing on the vast treasury of musical compositions that Christians throughout the ages have handed down to us. This means that a piece of medieval plainchant, a 19th-century anthem, and a 21st-century hymn may all have their place in the same Sunday service. In a world which is all too often broken and divided, we find that beautiful, thoughtful, well-crafted music, new and old, has the power to unite people as they offer praise to the living God. 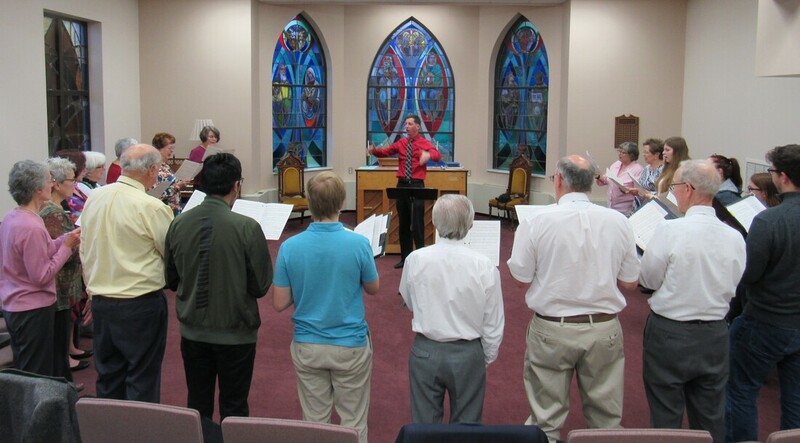 Please continue reading to learn more about the music program at First Presbyterian Church! For information about upcoming concerts and more, please visit our blog here. A mixed-voice choir has been a fixture of our 11:00 Sunday worship for more than a century. Currently numbering 20 singers, the Chancel Choir explores the great musical heritage of the church while including thoughtful works by composers of the present day. Rehearsals are on Sundays from 9:30-10:45 AM during the choir season (late August until early May). No musical training is necessary, though the ability to sing on pitch is required, as is a basic grasp of musical notation. Click to hear the Chancel Choir sing 'Acclamation for Palm Sunday' by Kevin Dill. ​Founded in 2014, this 10-voice ensemble sings several times per semester at the 11:00 service, with a focus on Renaissance polyphony, plainsong, and other a cappella music. The choral scholars who sing in the Chancel Choir also sing in the Saint Hildegard Choir. Rehearsals are on Thursday evenings on an as-needed basis. Click to hear the Saint Hildegard Choir sing 'Pan Divino Y Gracioso' by Francesco Guerrero. This 9-member handbell ensemble, established in 1975, rings monthly at the 11:00 service. They have also performed in concerts and other community events, including Meadville’s much-loved ‘Trees of Christmas’. Rehearsals are on Sundays, 12:15-1:00 from late August until mid-May. No prior handbell experience is necessary, but the ability to read music is helpful. Click to hear the Liberty Bells play 'Jubliant Fanfare' by Kevin McChesney. Thanks to the generous support of Dr. Dennis and Marci Finton, the French Creek Brass Quintet has once again been our artists-in-residence for the year. This ensemble, made up of professional brass players from across western Pennsylvania, will conclude their residency by enriching our worship services at 9:00 AM & 11:00 AM on Easter Sunday (April 21). In January 1970, a disastrous fire damaged the sanctuary and destroyed the four-manual organ built in 1924 by the Tellers-Kent company of Erie. The church engaged the Schlicker Organ Company of Buffalo to craft a new instrument of three manuals and 46 (now 47) ranks, inspired by German organs of the 18th century. Pictured are some of the pipes of the Great and Pedal divisions. This organ was dedicated in November 1972, and since that time has received a new console and blower, but is otherwise largely unaltered. With over 2,500 pipes it is Meadville’s largest instrument, and is frequently used for concerts in addition to being at the heart of our weekly worship. The stoplist can be found online here at the OHS database. Click to hear organist Kevin Dill and trumpeter Jennifer Dearden play 'Prayer of St Gregory' by Alan Hovhaness. ​Our 1897 Steinway model 'B' is often heard at recitals, and is occasionally used for Sunday worship. The rich tones of this historic instrument are an excellent match for the acoustic space it fills. We have a full 5-octave set of Schulmerich handbells and handchimes, entirely refurbished in 2015. Over the years First Presbyterian has commissioned and premiered works by several notable composers, including Morton Luvaas, Eric Routley, Walter Pelz, William Witherup, and Hal Hopson. Since 2006, the choirs and handbells have premiered over thirty works by current music director Kevin Dill. He would be delighted to share his compositions with interested musicians; simply e-mail him to request samples.